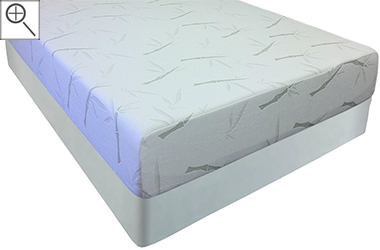 The "Slumberpedic 8" features a supportive core and a soft feel; especially for a memory foam mattress. Easy Rest is the best-reviewed memory foam mattress on the market and this model is a very cost efficient solution to finding renowned, supportive quality that comes with an Easy Rest. It's a hard balance to find the proper amount of support and softness in a mattress; especially a memory foam mattress. EasyRest has done a great job with achieving just that and they've also added a breathable cover and dollar-for-dollar, this one is hard to beat. For an upgraded version of this mattress, have a look at the Ten Inch Easy Rest Slumber-Pedic Mattress. It's still reasonably soft but offers a bit more contouring support and a thicker build-up.